We were taught early on to avoid saturated fat, or to watch our intake of it because it clogs arteries and causes heart disease. So it’s no surprise that coconut oil has received a bad rap. It wasn’t always looked at in a negative light – back in 1500 BC, it was documented in Sanskrit by Ayurvedic medicine that coconut oil had many valuable uses in all areas relating to the mind, body, and spirit. Then in the 1950’s & 60’s, heart disease was the primary cause of death in the United States. Research stated that ALL saturated fats/oils should be eliminated from the diet because it raised cholesterol levels. Weight Loss – as mentioned before, coconut oil contains lauric acid, which is a medium-chain fatty acid. MCFAs are directly absorbed into the blood via intestine capillaries (they speed up metabolism because they are so easily digested and converted into energy). As compared to long-chain fatty acids, which are too large to be directly released into the capillaries…instead they are stored as fat in the body. Coconut oil destroys candida, which triggers symptoms of weight gain, carbohydrate cravings, fatigue, etc (please see my earlier post). Coconut oil slows down the digestion of food, thus helps you feel more full after a meal. Hair care – coconut oil helps promote healthy hair growth. It works as a natural conditioner and can reconstruct damaged hair. If you massage it into your scalp/hair, you can get rid of dandruff. For a deep condition and shine treatment, apply it all over your hair, wrap your head overnight, and wash it out in the morning. Skin care – coconut oil is a safe and effective moisturizer comparable to that of mineral oil. It prevents dryness and flaking of the skin and can delay wrinkles. It’s been known to help in the treatment of psoriasis, dermatitis, eczema, and other skin infections. Coconut oil is a natural antimicrobial, which fights against bacteria. What’s great about using coconut oil is you won’t find any sulfates, parabens, or glycerols…which are found in many of the skin and hair care products out there. Digestion – coconut oil is digested and absorbed rapidly. It also enhances the absorption of other nutrients such as vitamins, minerals, and amino acids. Coconut oil has anti microbial properties which help fight against various bacteria, parasites, and fungi that cause indigestion. The medium-chain fatty acids found in coconut oil kill off bacteria, thus improving the digestive system…it can prevent various stomach and digestion related problems, such as IBS, ulcers, and colitis. Infections – as mentioned before, coconut oil has antimicrobial, antifungal, and antibacterial properties which all fight against harmful bacteria. According to the Coconut Research Center, coconut oil kills viruses that cause influenza, measles, hepatitis, herpes, SARS, etc. It also kills bacteria that cause ulcers, throat infections, urinary tract infections, pneumonia, and gonorrhea, etc. Coconut oil is also effective on fungi and yeast that cause candidiasis, ringworm, athlete’s foot, thrush, diaper rash, etc. Stress relief, increased immunity, relief from kidney problems, high blood pressure, and diabetes…it is also beneficial in dental care, and bone strength. 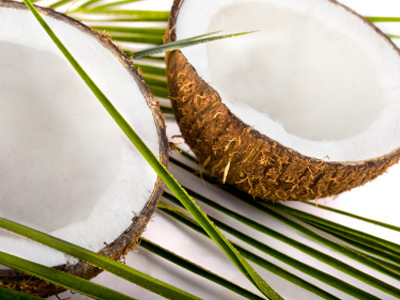 I use coconut oil in smoothies, stir-fry, raw desserts, and I use it on my skin & hair. There have even been times when I’ll just eat a spoonful of it! Be sure to use virgin coconut oil to get all of the benefits that I talked about. Stay away from refined coconut oil. Brands to buy: Ultimate Superfoods (has the best of the best coconut oil) or Nutiva is one that can be found in most health food stores or online. Prev I am NOT a hypochondriac! Next What’s in YOUR toothpaste? !